Those four commands will start your mind racing and your adrenalin pumping in the fast paced sport of pinshooting. WHATshooting? 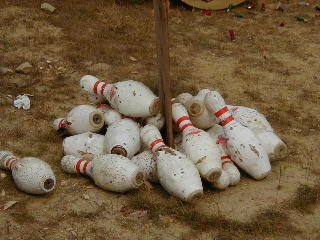 That's right, bowling pins. Three and a half pounds of tough, mean, hard skinned, thumbin' their nose at you outcasts of the local bowling alley. Didn't they tell him? You can't use a phaser for bowling pins! Looks easy enough, all you have to do is stand 25 feet away from a table that has five pins set up on it. At the fire command, raise your firearm and blast the pins off the table until the last one leaves the table - that's when the watch stops. Do it two more times, the slowest time is thrown out, and the fastest two are averaged for your score. All this fun for only $3.00 for three 5-pin tables. Don't have a pin gun? Yes you do! 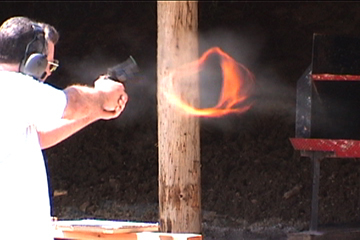 We offer categories ( see below ) for practically any caliber of handgun and gauge of shotgun. No subguns, long guns, or crew served weapons please. We don't strictly adhere to IPSA (International Pin Shooting Association) pin setups for all events. However, we do follow IPSA safety rules. Our top two priorities are SAFETY and FUN, in that order. Eye protection is required at all times at the pin range. If you can see the pinshoot bay, make sure you have your glasses on. The range officer has the final say on any safety related issues, (such as, but not limited to: gun handling, caliber, ammo type, adequate eye protection, firearm defects, etc.). Tickets are sold for this event. Director uses tickets to record shooter's name, gun used and category, and times on each table. Ticket sales are scheduled to end at 2pm. With a large turnout this will hold true. If turnout is light and there are not very many shooters, tickets might be sold after 2pm. Director will have club gate open at 11:30am for non-members. New shooters are encouraged to show up a few minutes before the official start time for a quick training/orientation session. New shooters are encouraged to watch a few rounds and then directors will coach you through your first few tables. Hope to see you there! Unlimited Auto- Optics, comps, weights, etc. Unlimited Revolver- Optics, comps, weights, etc.